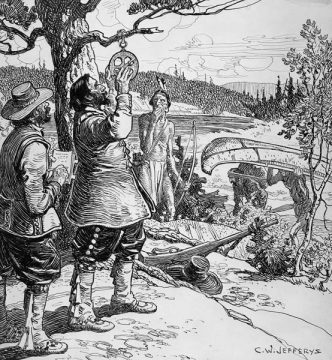 Samuel de Champlain’s publications are full of vivid descriptions of encounters with new landscapes, waterways and peoples. He wrote extensively about his explorations and experiences in North America. 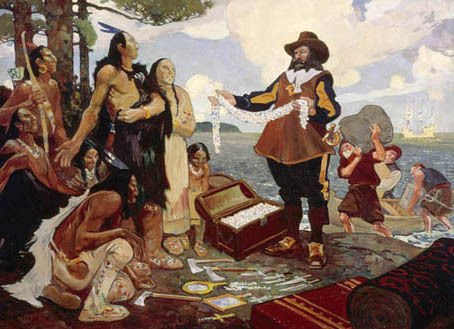 Over time, historians and artists have studied Champlain’s work closely and have used it to create both written and visual portrayals of his life and his role in the history of Canada. 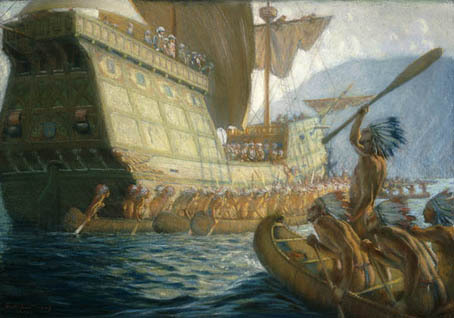 Very little is known about what Champlain actually looked like, so artists have had to rely on their imagination and their interpretation of the writings of Champlain and of historians to create visual representations of him and his experiences. 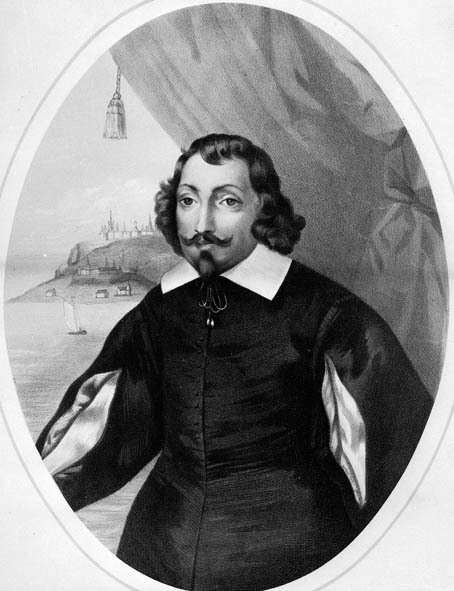 For many years, people searched for a genuine image of Samuel de Champlain. 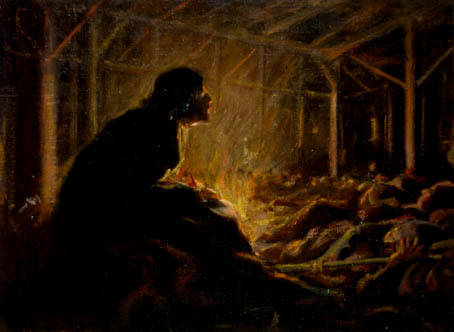 The above lithograph (see the photo gallery slideshow) was believed to have been created by the artist Louis-César-Joseph Ducornet in 1854 and became widely accepted as authentic. 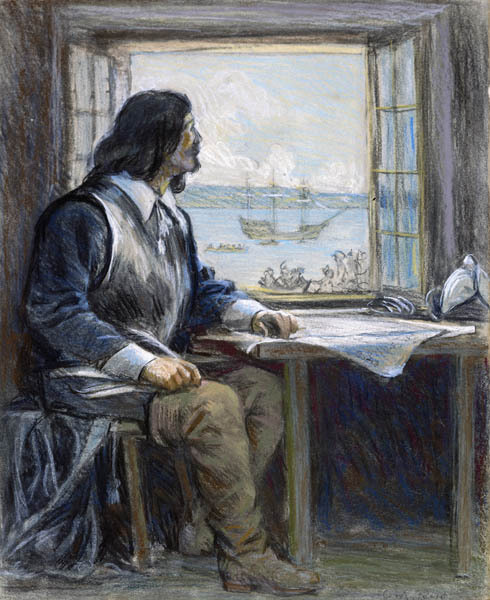 Later discovered not to be a portrait of Samuel de Champlain, it is instead based on a portrait of Michel Particelli d’Emery engraved by the artist Balthazar Moncornet in 1654! In the early 20th century, two Canadian artists – George Agnew Reid and Charles William Jefferys – used their historical knowledge, artistic skills and imagination to produce numerous works of art focusing on Samuel de Champlain and his role in Canadian history. Through their work, these artists attempted to bring history to life and to excite Canadians about their country’s past. George A. Reid was principal of the Central Ontario School of Art and Design, now the Ontario College of Art and Design University (OCAD), from 1912 to 1918. He painted numerous murals for public spaces in Toronto, including Jarvis Collegiate, the Royal Ontario Museum and Toronto City Hall. The art George A. Reid and C.W. Jefferys created depicting scenes from Canada’s past is a product of a particular place and time. 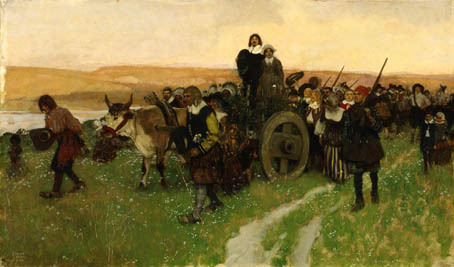 It reflects how each artist interpreted the history available to him and how the time period and location in which he was working influenced his art. In July, 1908, a large two-week celebration was held in Quebec City to commemorate the 300th anniversary of its founding. The festivities included historical pageants in which scenes from Canadian history were re-enacted in front of large audiences on the Plains of Abraham. An actor represented Samuel de Champlain as the founder of Quebec. 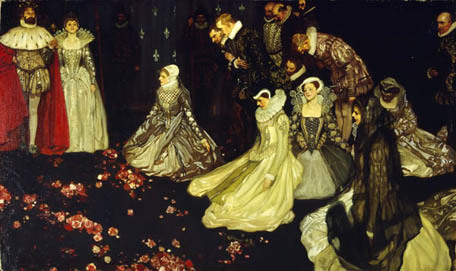 Scenes from the pageant were later re-created as works of art. 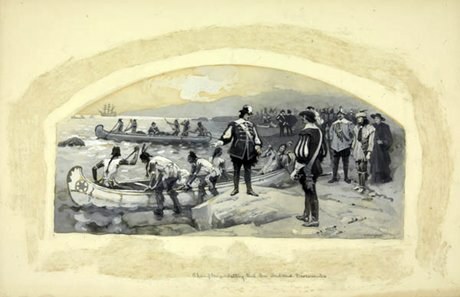 Frank Craig created several paintings (see the photo gallery slideshow), depicting scenes I and II of the second pageant, for publication in The King’s Book of Quebec (1911). The image below was designed for a postage stamp created to commemorate Quebec’s tercentenary. 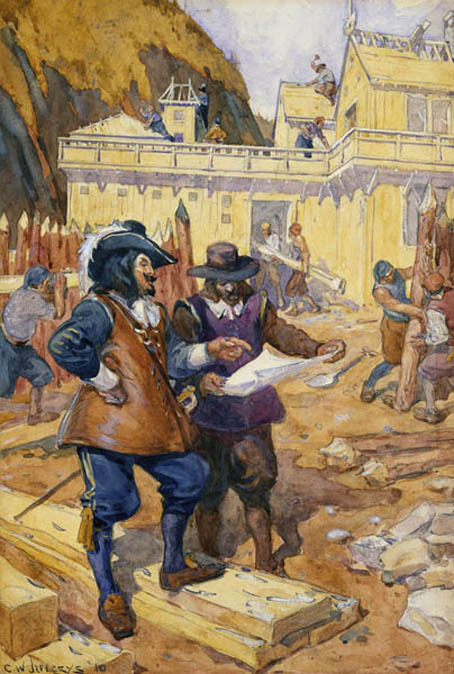 The detail in the image provides a window into how Champlain’s role as an explorer has been visually interpreted over time. 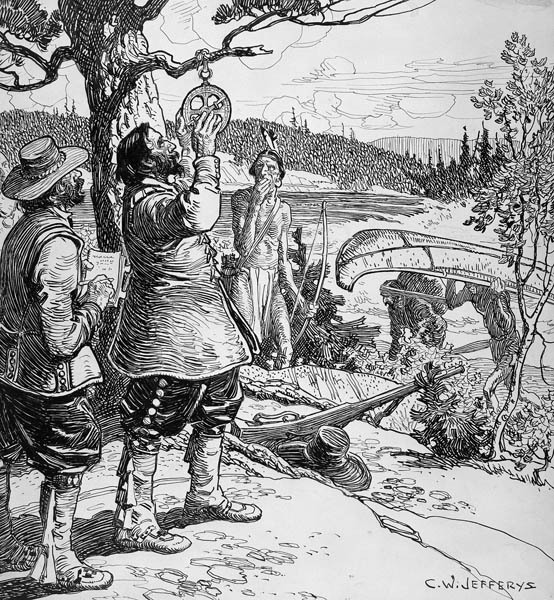 These visual representations demonstrate how both live performance and visual art have been used to portray Champlain’s role in the larger story of Canada. The historical pageants and other celebrations held at Quebec City in 1908 attempted not only to tell this story, but also to promote national unity and a shared vision of what it meant to be Canadian at that time. 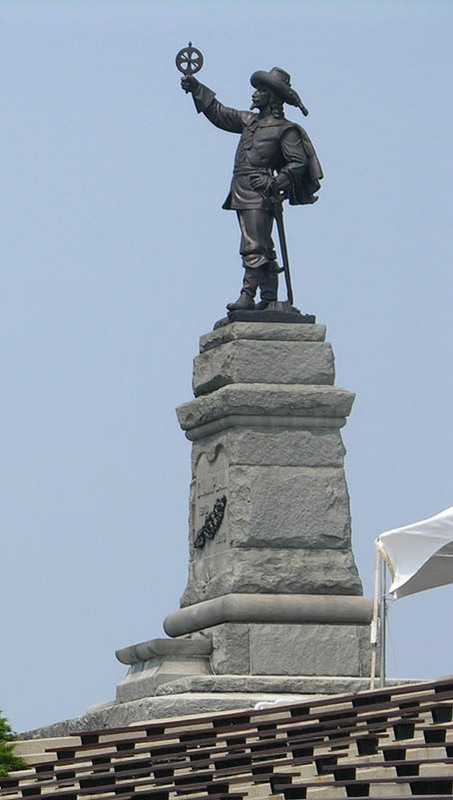 In the late 19th and early 20th centuries, seven statues commemorating Samuel de Champlain were installed in communities in three Canadian provinces and one American state. 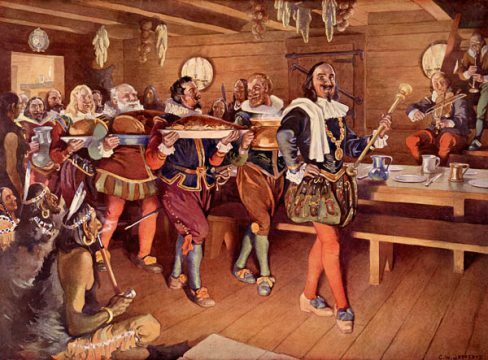 In nearly every case, they were intended to celebrate the 300th anniversary of Champlain’s explorations. 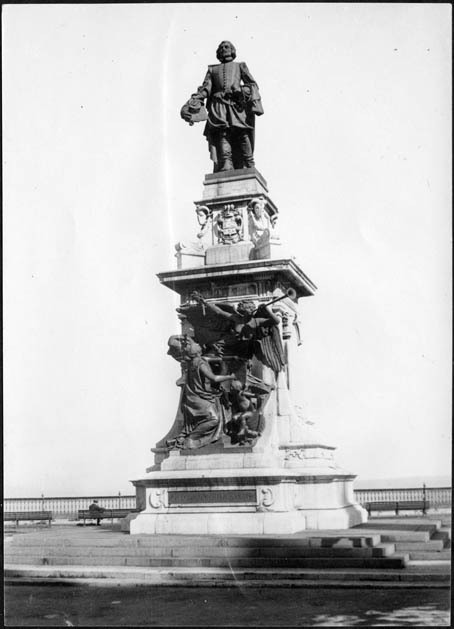 This monument to Champlain was unveiled at Quebec City on September 21, 1898. It was designed and created by sculptor Paul Chevré and architect Paul Le Cardonnel. This monument was installed on May 27, 1915. It was created to celebrate the 300th anniversary of Champlain’s landing at the site of Ottawa in June, 1613. Sculptor Hamilton MacCarthy created this monument. 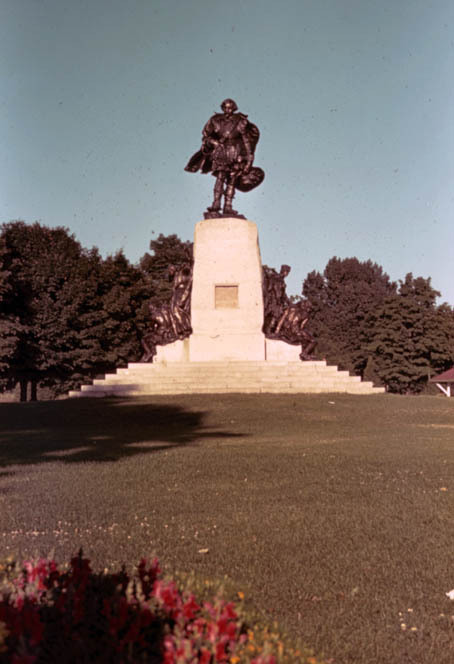 This monument was installed on July 1, 1925, to commemorate Champlain’s journey to Huronia in 1615. Vernon March created this monument. These monuments are physical representations of Champlain’s role as explorer and founder of Québec. They also tell us much about how his role in Canadian history has been interpreted by artists and communities over time. In this way, they act as important historical resources.